Official Google Webmaster Central Blog: Join us at cool SES San Jose - it'll be hot! Join us at cool SES San Jose - it'll be hot! As summer inches towards fall and in many places the temperature is still rising, you're probably thinking the best place to be right now is on the beach, by a pool or inside somewhere that's air-conditioned. These are all good choices, but next week there's somewhere else to be that's both hot and cool: the Search Engines Strategies conference in San Jose. In addition to the many tantalizing conference sessions covering diverse topics related to search, there will be refreshments, food, and of course, air-conditioning. 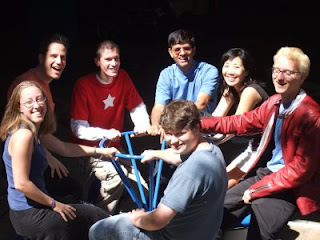 Additionally, on Tuesday evening at our Mountain View ‘plex we're hosting the “Google Dance” -- where conference attendees can eat, drink, play, dance, and talk about search. During the Google Dance be sure to attend the “Meet the Engineers” event where you’ll be able to meet and have a conversation with 25 or more engineers including Webmaster Central’s own Amanda Camp. Also, if you get a spare minute from merry-making, head over to the Webmaster Tools booth, where you’ll find Maile Ohye offering lots of good advice. We will also have a large presence in the conference expo hall where members of the Webmaster Central Team like Susan Moskwa and I will be present at the Webmaster Tools booth to answer questions, listen to your thoughts and generally be there to chat about all things webmaster related. Bergy and Wysz, two more of us who tackle tough questions in the Webmaster Help Groups, will be offering assistance at the Google booth (live and in person, not via discussion thread). If you're reading this and thinking, "I should go and grab the last frozen juice bar in the freezer," I suggest that you save that frozen juice bar for when you return from the conference and find that your brain's overheating from employing all the strategies you've learned and networking with all the people you've met. Joking aside, we are psyched about the conference and hope to see you there. Save a cold beverage for me!